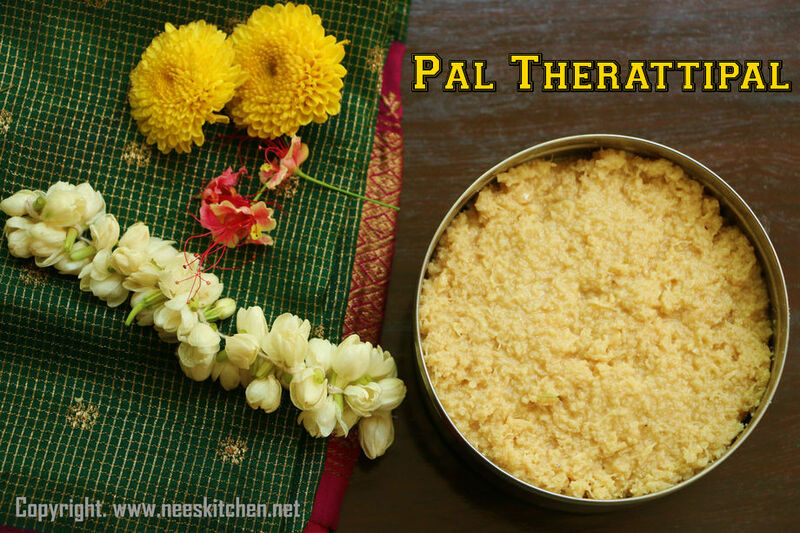 Pal Therattipal is a traditional recipe made in our home during festive seasons. Milk is boiled well and cooked until it is reduced into 1/4th of its quantity or thicker consistency and added with sugar. A simple and tasty traditional sweet ideal for any festival. The recipe for this post is prepared by my mother and hence you would see a different kitchen and vessels. There are various ways to prepare this recipe and I generally use condense milk and yogurt in microwave which is the easiest of all. My mother does it in the traditional way by just using milk and sugar. Some of them use jaggery in place of sugar but I like the sugar version only. This way of cooking the recipe is time consuming but the taste will be just awesome. The measurements and duration for this recipe is just perfect and it might change if there is a change in quantity. The taste and results are best in full cream milk rather than the fat free ones.If you are in Singapore I felt that Dutch lady milk was just perfect for this. However this is only my personal opinion and I had tried only with 2 or 3 brands here. This recipe was prepared in Chennai and we use the aavin milk which is the regular milk supplier there. Sugar can be either white or brown sugar. There will not be much differences in taste, however color would change slightly. Adding cardamom powder is optional and I felt the flavor enhanced well after adding it. Make sure to use a heavy bottom vessal else the milk would get burnt easily. The best is to use the cooker vessel if you do not have heavier ones.would differ. If you still do not have one you need to change to 4 different vessels at an interval of 30 minutes. P:S - The products mentioned in this post are just based on my personal usage and experience. This is not an advertisement. 1. Take a heavy bottom vessel, preferably a cooker pan. Add milk keeping the gas at low. Mix it every 6-8 minutes for the first 1 hour 15 mins. After which must keep stirring every 3-4mins until adding sugar. 2. Keep cleaning the corners in the pan at regular intervals. You may use a knife to scrap the corners. 3. Add sugar when the quantity is nearly 1/4th which is about 1hr 30 mins. 4. Once sugar is added we must keep stirring continuously. 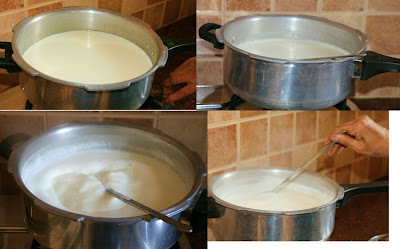 The milk might get diluted due to sugar initially but it will thicken immediately. 5. 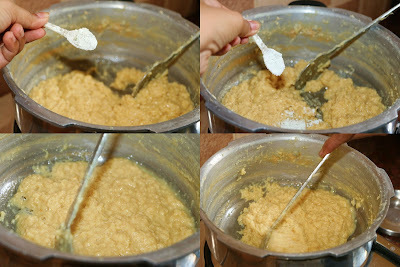 Once it thickens like a therattipal consistency add cardamom powder which we added just 5 minutes before switching off. 6. Switch off the gas and leave the therattipal for 5 mins in the pan. Therattipal is ready to be served.